A garden is a work of art. Above all, however, it provides an opportunity for exchanging ideas, sharing experiences and meeting other plant lovers. Marie and Gérard Defaÿsse live this adventure to the full and are passionate enthusiasts of Botrain manor. They have given it back its genteel beauty by surrounding it with theme gardens. A series of over 22 gardens can be found here: visitors on their way from the Japanese garden to the rose garden pass the garden of medicinal plants, the sumptuous English herbaceous borders, the iris garden, the lilac garden, the blue avenue, the undergrowth of rhododendrons, the greenhouse, the vegetable garden and the shore of the pond before finally arriving at the near-natural marsh garden. The manor and its 18th century apiary of slate are part of Brittany’s historical cultural heritage. An encounter with landscape architect Michel Gesret in 1993 resulted in these ideas taking on more concrete form. Michel Gesret brought with him a flair for architecture and colour from his time at the Academy of Art. His work at Botrain soon became indispensible and he created a series of gardens with small, intimate scenes. The entrance is laid out as an avenue with ‘Sunset Boulevard’ cherry trees which produce a remarkable display of blossoms in spring. A small avenue in front of the veranda produces flowers throughout the year and leads to the medicinal and herb garden. The manor courtyard is regularly given a new look with spring and autumn flowers. 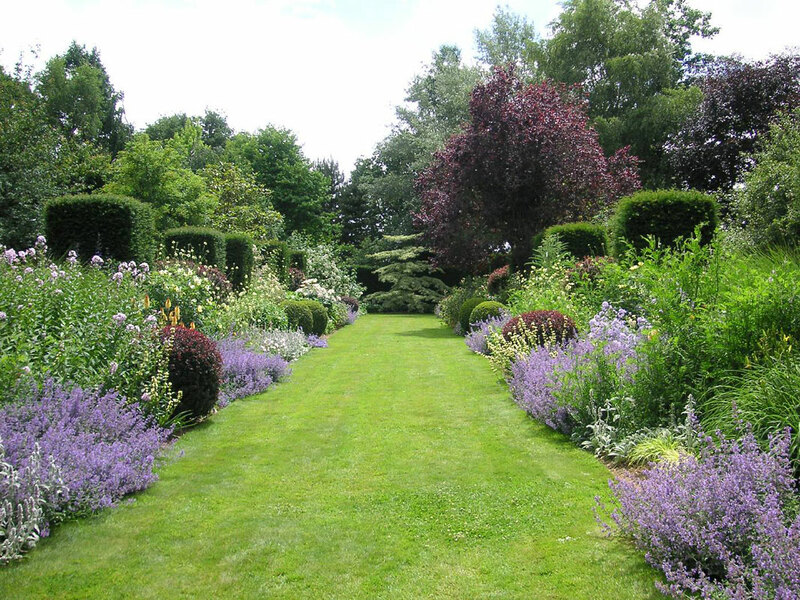 But the herbaceous perennials between the shrubs in the flowerbeds are also renewed from time to time. A rectangular boxwood hedge surrounds a carpet of ‘Fée des Neiges’ roses. Narcissi and tulips add a lively touch to the flowerbed in spring. Following an idea by Marie Dafaÿsse, Michel Gesret created two large parallel borders with columns of yew and balls of boxwood as structural elements. Balls of purple Berberis are reminiscent of a similarly-coloured Prunus which has survived. A pagoda of dogwood (Cornus controversa ‘variegata’) has pride of place at the focal point of the avenue. Carpets of yellow and white narcissi provide spring decoration. This avenue radiates in full splendour with roses and perennials from the end of May. A 3.65 metre menhir of slate is surrounded by plants which flower in succession from spring to autumn. A flowerbed with rare botanical rhododendrons and camellias runs along the eastern edge of the estate. In addition, various herbaceous perennials have been planted to the front. Narcissi and spurges (Euphorbia) are accompanied in spring by several varieties of common lilac andRhododendron yakushimanum. Verbena und Rudbeckia join the various sweet grasses in autumn. The pergola is 15 metres long and provides support for roses and clematis. Planted at its base are sweetshrubs, French hydrangeas (Hydrangea macrophylla ‘nigra’) and mountain hydrangeas (Hydrangea serrata). The upper part is formed by a clearing which is home to maples, hydrangeas, navelwort (Omphalodes) and geraniums. The area under the oaks slopes down to the pond and has been left in its natural state. It contains shade-loving and heathland plants. A path which lies hidden between the plants in both sunlight and shade winds its way around the pond, which also provides water for the garden. A whole series of plants flower in succession throughout the year: Andromeda, rhododendrons, azaleas and common loosestrife. A banana tree adds an exotic touch as does the giant rhubarb (Gunnera) which grows majestically at the end of the marsh garden. The marsh garden at the end of the pond is home to plants which are adapted to this cooler terrain: yellow irises, carpets of Primula candelabra, purple loosestrife, giant reeds, horsetails and marsh forget-me-nots. A little further into the water are pickerel weeds, Thalia und marsh marigolds. Tree ferns can be found on the other side of the wisteria-covered wooden bridge. The small greenhouse of steel and glass is divided into two sections. The first is open to the public and houses plants for cool greenhouses. These include Chilean bellflowers, Madeira geraniums and black-eyed Susans as well as rare botanical tulips, narcissi, alpine plants and pelargoniums in pots which are changed according to the seasons. The second section is a warm greenhouse containing plants which require some warmth in winter. Pergolas painted in dark blue provide a structure for the rose garden, a place conceived for immersing oneself in the world of roses. Many of these roses are climbers just like English roses while many others are scented (‘Princesse de Nassau’, ‘Jacques Cartier’) Blue herbaceous perennials cover the ground decoratively in spring. Four small biotopes provide a setting for rockery plants. An avenue of blue flowers and foliage combined with their complementary colour, yellow, has been laid out in place of a hollow path which once led to the manor. From June to August daily from 2 – 6 p.m.
From Easter to Allhallows every Weekend an on Holydays from 2 – 6 p.m.